OOTD - Shorts and Tights, Summer to Fall | La Petite Noob | A Toronto-Based Fashion and Lifestyle Blog. I have a small confession - as sad as I was to see the end of Summer, I'm secretly glad about Fall's arrival. There's something about wearing cozy knits and layering different materials that just soothes my soul. As long as we can keep things at a reasonable temperature - without any snow - then I'll be a happy camper. A rare shot without sunglasses. Random fact - my eyes are ridiculously sensitive to the light, and I end up squinting even on a cloudy day. I've heard that this is common among people with very light coloured eyes. Does anyone else have the same problem? How are you transitioning your wardrobe from Summer to Fall? Love the boots! Such a nice look! LOVE this! 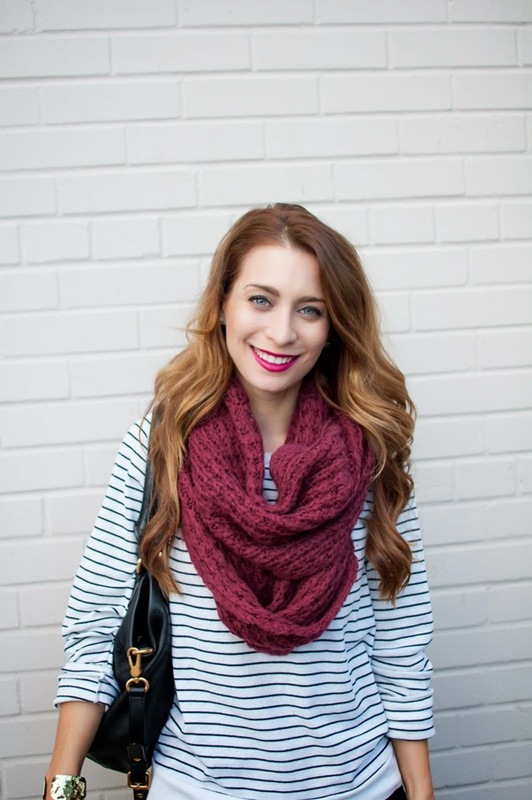 It's the perfect summer to fall transition outfit! Thanks Alicia, I love shorts and tights as a transitional outfit too! Adorable outfit, and I love the no sunglasses shot ;). Haha thanks Kris - exposed for my squinty self! You totally rock the tights under shorts look. :) Sometimes I'm not sure about it, but I really love this, especially with the stripes and scarf. If only I had a pair of black shorts to try this! Love it! I am obsessed with shorts and tights. I bought a pair of leg warmers too so I can hopefully continue wearing them in the winter. We'll have to see how cold it gets though. I'm totally a fan of shorts with tights, especially pleather shorts!